Kind-hearted restaurant staff have come up with an egg-cellent idea to raise money for a children’s hospice charity. 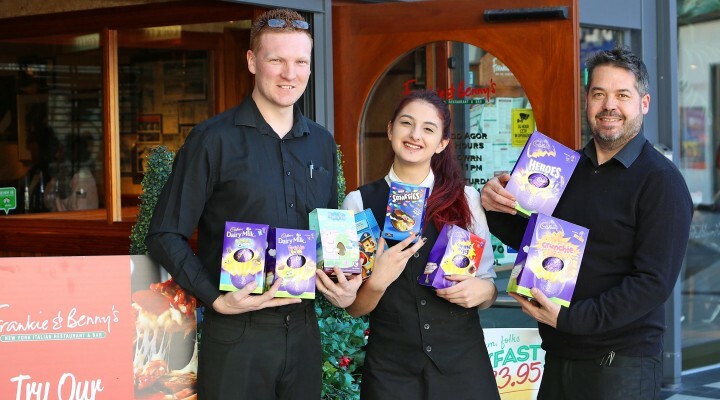 The team at Frankie and Benny’s at Eagles Meadow in Wrexham are organising their own Easter Egg Hunt with all the chocolate delights they discover going to Hope House/Tŷ Gobaith. Customers can donate chocolate Easter Eggs to the restaurant and the staff will then deliver the eggs to the hospices. The team at Frankie and Benny’s at the Eagles Meadow shopping centre in Wrexham have pledged their support to the hospice organisation throughout 2017. They need to raise £6.2 million a year to maintain their vital services for children with life-limiting conditions and their families. The charity have two hospices, Hope House near Oswestry and Tŷ Gobaith in the Conwy Valley. Frankie and Benny’s manager Peter Cross says the charity scheme has been organised through the restaurant’s partner charity, Together for Short Lives. He said: “We came up with the idea and our brilliant customers have responded really well. We already have quite a few Easter Eggs that have been donated and I’m sure we will have many, many more before Easter arrives. “I’m hoping we will have lots more Easter Eggs donated by our customers and all staff members have all agreed to bring in Easter Eggs too. Anything we can do to help is worthwhile. Eagles Meadow Shopping Centre manager Kevin Critchley says the Easter Egg collection for children at Hope House Children’s Hospices is a wonderful idea. He said: “It’s such a simple idea but one that will bring a smile to the faces of lots of very sick children. The number of fundraising and charity ideas staff of our shops, leisure outlets and restaurants come up with is amazing. This entry was posted in Business, Charity, Community, Food, News. Bookmark the permalink.